A civil rights group told a Southgate Montessori school in a letter Tuesday that its online enrollment application calling for proof of citizenship and residency, and asking for primary language is unconstitutional. By Tuesday night, the school said it had dropped some of the offending questions in its online application. The American Civil Liberties Union of Michigan sent the letter to the headmaster of the Creative Montessori Academy on Tuesday, saying the questions were unconstitutional and the process can stigmatize children and deny them an education. 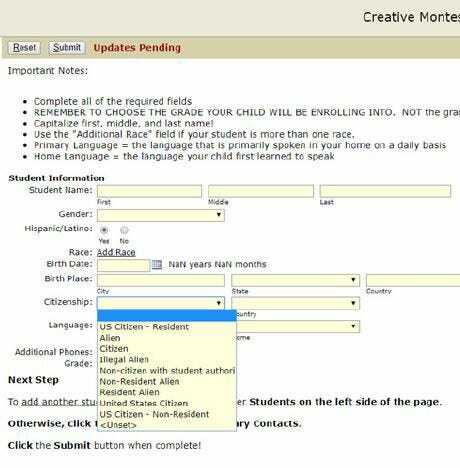 The online enrollment application required applicants to reveal their immigration status and provide a birth certificate. It also required parents to upload a Michigan driver's license, which effectively prevented undocumented parents from enrolling children in the school. The school Tuesday night said it used an outsourced system through Wayne RESA, a regional educational agency for Wayne County. "It appears that we had all fields that were available 'turned on,' so to speak," said Creative Montessori Superintendent Laura Moellering. "Student information systems are very robust and have the capability of collecting all kinds of information under any conceivable situation for a broad array of needs. "That said, we do not need nor did we intend to collect this information for any purpose. Furthermore, once a parent or guardian would come to the school we follow typical procedures of allowing several types of documentation in lieu of Michigan driver's licenses or IDs." However, the ACLU said Wednesday that the school had not corrected the enrollment application. "Once a parent or guardian would come to the school we follow typical procedures of allowing several types of documentation in lieu of Michigan driver's licenses or IDs -- this requirement was removed; however, how is a parent supposed to know what they can use in lieu of a license?" said Abril Valdes, an ACLU immigrant rights attorney. Valdes said the requirements violated the 14th amendment by denying undocumented school-age children a free public education. "Every child has a right to an education," Valdes said. "Immigrant children are in this country through no fault of their own. No child should be stigmatized or be labeled as an 'illegal alien' by their school when looking to obtain an education. No parent should have to provide a Michigan driver’s license when the state does not make it possible for undocumented immigrants to obtain a license." Valdes said while trying to select a citizenship option on the school's online application, anyone would be confused at the multiple options. The drop-down menu had four options for U.S. citizens including US Citizen - Resident, Citizen, United States Citizen and US Citizen - non-resident. There are also three "Alien" categories without descriptions. "They're duplicates and almost contradict each other," Valdes said of the options. "There are four options. ... Even as a lawyer and a citizen, I don't even know what the best option is." Originally,the online platform will not allow the user to submit the application without filling out the required fields. By Thursday, the online fields were not a requirement but were still fields on the application. "They have already rectified the portal so that no one will be prevented from enrolling online," Valdes said. "The application is still requesting citizenship status. There is no information on what is required versus optional. How is a parent supposed to differentiate?" The complaints were filed to district and state officials along with headmaster of the school, Alan Carter. Wayne County RESA Superintendent Randy Liepa and state officials did not provide comment. Moellering said the director of information technology at Wayne RESA corrected the portal late Tuesday to hide the citizenship fields and remove the driver's license requirement. "It is our intention to make sure that we have an application that is fully compliant with the law and welcoming to all families," Moellering said. "It appears that the technology side may be harder to correct than I thought earlier. "As for the birth certificate, we allow for other means of determining date of birth and custody, and do so as needed at the school." Valdes said every day the school doesn't correct the problem is another day a parent may go without enrolling their child. "Academy needs to make it clear what other documents parents can use to prove residency," Valdes said. "We suggest looking at the Department of Education's guidance we referenced in the letter. Further, asking for place of birth is unnecessary." Rita Aceves, a parent with a student at the school, was applying for another child to attend. She said she was shocked by the change in the enrollment process. "The enrollment process isn’t a reflection of the excellent school or its staff," Aceves said. "I went through the application process and because of my previous positive experience with the school, I was shocked when I saw the information. It's truly shaken me to my core. It seemed so foreign to me and stuck with me. I felt I had to do something about it." Aceves, a U.S. citizen, she said she recognized that the questions on the application could dissuade parents from enrolling their children in the academy. "This is a bad call from somebody, and I don’t know what the purpose is and what they were going to do with that information," she said. "It pains me. As a parent, I can not imagine the emotional toll on children and stress on the family. How devastating the result can be to a child when they realize they may not have the opportunity for a higher education." Creative Montessori Academy is a charter school authorized by Wayne RESA. "While there is a connection to Wayne RESA here, and, as the authorizing body, Wayne RESA has a duty to 'oversee compliance . . . with all applicable law,' ” Valdes said quoting School Code Act 451. The U.S. Supreme Court, in Plyler v. Doe, held that children have a constitutional right to a free public K-12 education, regardless of their immigration status. The right, Valdes said, can be compromised by discriminatory school enrollment practices. "It means that undocumented parents cannot enroll their children, who may very well be U.S. citizens, and it means undocumented children have to expose their vulnerable status on an application with information that we have no idea how it is being used or for what purpose," Valdes said. "It means parents have to make the frightening choice of enrolling in this school and exposing themselves to their community or looking for an alternative." Aceves said she didn't approach the school first because she doesn't think it was purposeful by the school. "I think they would have acknowledged it, but this is something that’s bigger," she said. "They probably didn’t know what they were doing and unfortunately, the school has to be used as a bad example to prevent other schools from doing this.